Sea cliff climbing is one of those unforgettable, adventurous, addictive and atmospheric experiences. 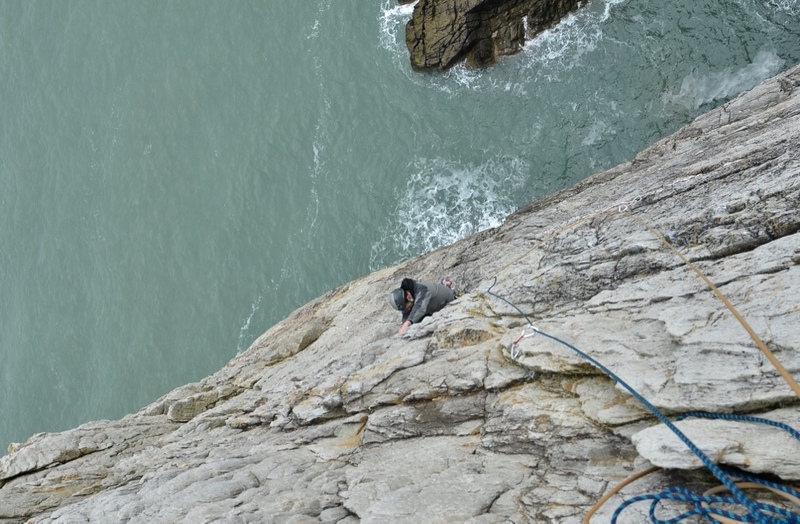 Our 2-day sea cliff climbing course is for the climber who would like to take their skills further on sea cliff routes. It will give you the tools to lead climb in some of the UK’s most spectacular coastal locations, looking directly down onto the sea! By the end of the course, you will have the tools to sea cliff climb safely all over the UK and abroad. Our sea cliff climbing course will teach you the skills that you need to climb sea cliffs safely.One of the more important issues regarding sea cliff climbing, is the effects of the sea (swell, i.e. waves) and the tides. We will spend some time analysing these, and helping you understand how to plan a day out on sea cliffs. Without being washed away! The sea cliff climbing course is 2, 3 or 4 days long, and is run in Devon, Dorset, Pembroke or North Wales (mainly Gogarth). The client-to-instructor ratio does not exceed 2:1, to ensure that we can give you our fullest attention. Devon, Dorset, Pembroke or Gogarth in North Wales. You need to be lead climbing to level 5c indoors; some outdoor climbing experience is beneficial (seconding and/or leading). If in doubt about whether the course is suitable for you, please don’t hesitate to contact us. Each day of our sea cliff climbing course we would introduce the topic of weather, tides, and swell. And look at how this would affect venue selection, and route planning, and timings. You will learn everything you need to go sea cliff climbing. We will look at equipment selection, a sea cliff climbing rack (what is enough), route selection, guidebooks, climbing calls and communication. Most importantly, we will look at the sea tides and swell, and look at how this affects our route selection. As with a sea cliff we start at the top, we will show how to rig an abseil, and abseil safely. We will also look at rope and stance management, as there is a smaller margin for error, these are very important. Here we get you to put all you have seen on the previous day into practice. We will also emphasise hanging belays, and most importantly descending safely. Here we try and give you some of the ownership and decision-making process. So that you feel at the end of the course that you can go out and do this by yourself. We will also look at some common problems, prevention, and solutions. The course content and location tends to be dictated to us by the weather and the tides, so the sea cliff climbing course layout can change. With this course you can opt for 2, 3 or 4 days. Depending on how quickly you learn, there is a lot of information to take in. Especially if you are newer to climbing, we would suggest going for 3 or 4 days. The course layout is then adjusted for the duration of the course. If you are unsure whether the sea cliff climbing course is suitable for you, please do not hesitate to contact us on info@riseandsummit.co.ukor call us on 07775 853 348, and we would be happy to help.